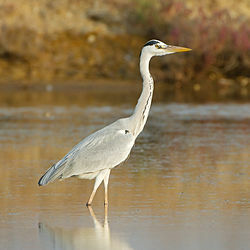 The Grey Heron is a bird that lives in temperate parts of Europe, Asia and also parts of Africa. It has long legs and walks through shallow water looking for food. The bird's scientific name is Ardea cinerea. This page was last changed on 5 April 2019, at 07:30.